Years ago the only method of installing traditional 3/4" hardwood on concrete was the sleeper method. Rarely used in residential today, this method created problems with overall finished floor height. Notice illustration #1 to the right. By using the sleeper method, which are 2' x 4's placed on their side, plus 3/4" hardwood, your final floor height reaches a whopping two and one quarter inches! Planned properly from the pre construction phase it could work, but we find this method outdated. Adding to disadvantages was the feel underfoot as they would often sound clunky for lack of a better description. 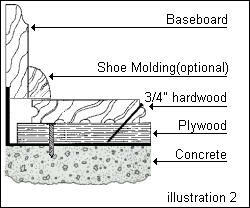 Shown in illustration #2 is the norm for solid hardwood on concrete in our region. Gone are the bulky sleepers replaced by 3/4" CDX plywood attached to the concrete with special concrete fasteners (tapcons). Not shown is #15 asphalt felt paper and 6 mil visqueen (poly film) placed on top of the concrete prior to fastening the plywood. For installations with stone or marble flooring, the plywood method may actually be beneficial. Reasons being, stone and marble work require absolute level installations. Often the floor height is increased substantially when these types of floor coverings are used. In some cases adding plywood and hardwood allows for a smooth transition from one floor to another; they becomes flush with one another. I know what some are thinking. "Yuck, engineered, you mean that laminate looking stuff?" 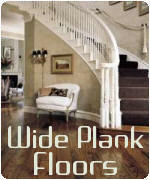 Engineered hardwoods have come a long way over the last decade. Today there are many choices to consider.